BETHLEHEM, Pa. (July 23, 2018) - Unity Bank recently opened its first Bethlehem branch, second in the Lehigh Valley, and will introduce its new team during a special community event Saturday, July 28th featuring a live broadcast from Spin Radio 107.1 WWYY-FM. The family-friendly program will include free food, face painting and balloon art from 9 a.m. until Noon at the 2850 Easton Avenue location. Unity's local team includes Easton resident Londa M. Weber, who recently joined the bank as Bethlehem Relationship Manager. Weber has more than 20 years of Lehigh Valley banking experience at regional banks. "We are excited to now be open in Bethlehem and to have a team in place that has strong roots in the region," said Janice Bolomey, Unity Director of Sales & Chief Administrative Officer. "We are a community bank so having staff involved in the community is very important. Unity prides itself in being an active corporate citizen in all the communities where we offer branch services." Unity leased and renovated a freestanding 3,500-square-foot building adjacent to a shopping center anchored by Giant Food and Family Dollar stores for its Bethlehem branch. "We are committed to growing our branch footprint and commercial lending services in the Lehigh Valley," said Unity's Chief Lending Officer Stephen Rooney. "We have assembled an experienced and professional staff that can quickly respond to customer needs. As a community bank, Unity is more flexible than most larger institutions and one of our goals is to demonstrate that our business model can help fulfill the needs of the local and regional business community." 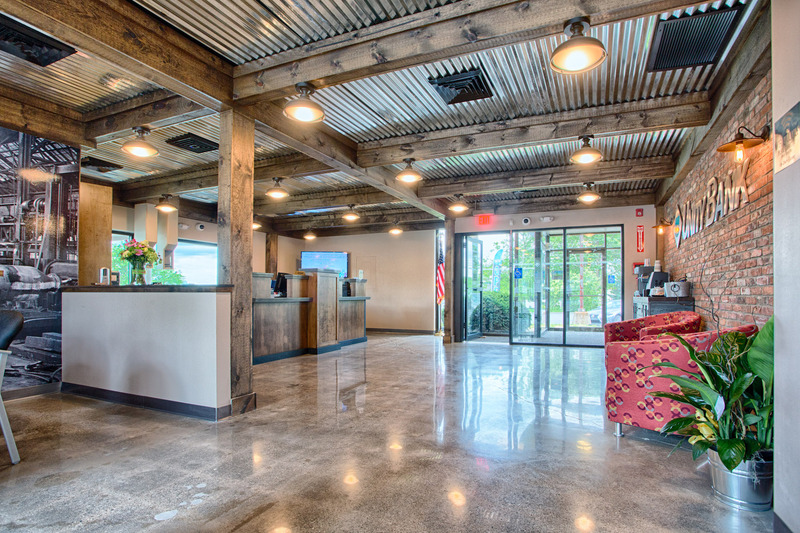 The Easton Avenue branch has a unique interior design compared to Unity's 18 other locations, featuring exposed wood beams and corrugated metal ceilings as well as industrial wall murals. "We wanted to pay tribute to Bethlehem Steel and the significance of that industry to the community," said Bolomey. "We always strive to go the extra mile for our customers and that includes creating a professional environment that fits in culturally with Bethlehem."